DECK JOISTS: Cut Deck Flash Barrier to the proper length. When applying to the tops and ends of deck joists, center over joist. Remove release paper and press in place. Firmly crease and fold Deck Flash Barrier over both sides of the joist. To maximize adhesion, roll with a small hand roller. POSTS: When protecting posts, Deck Flash Barrier should be applied at the ground level with 2 to 3 inches extending above the finished grade. To determine the proper location on the post for product placement, insert the post in the hole, mark the post indicating the grade level, and then remove the post from the hole. To determine the proper length of Deck Flash Barrier to use, without removing the white release paper, wrap the material around the post, making sure that there is enough material for a minimum 3 inch overlap. Cut Deck Flash Barrier to proper length. Remove release paper and wrap around post while firmly pressing in place. To maximize adhesion, roll with a small hand roller. To provide additional protection against deep standing water around the post, a bead of non-silicone caulk may be applied to the top edge of the Deck Flash Barrier. LEDGER BOARDS: Twelve inch Deck Flash Barrier is recommended to provide ledger board protection. It should be installed with a minimum of 3 inches of material up the wall of the building, and a minimum of 3 inches of material down the face of the ledger board. Always make sure that on the wall of the building, Deck Flash Barrier is installed under the house wrap or weather resistive barrier. To maximize adhesion, roll with a small hand roller. Deck Flash Barrier should be applied to clean dry surfaces when temperatures are a minimum of 40°F or warmer. If site conditions prevent proper adhesion, Deck Flash Barrier can be mechanically attached using staples or nails, or a construction grade spray adhesive can be used to increase adhesion. Deck Flash Barrier is designed to be covered by either deck boards or siding, and should not be exposed to direct sunlight for more than 90 days. 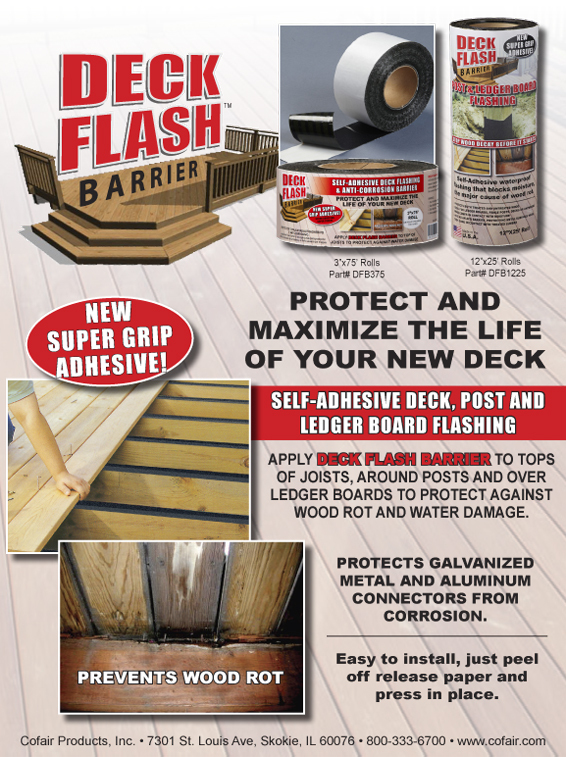 Although Deck Flash Barrier has a slip-resistant surface, it may still be slippery. Extreme caution should be used when walking or standing on Deck Flash Barrier.